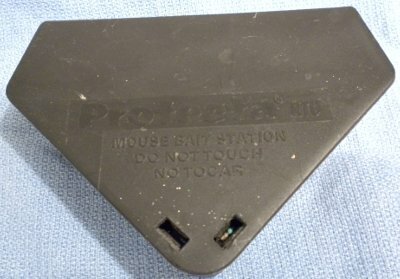 Professional pest control operators place rodenticides in childproof and petproof bait stations. it is more likely that he suffered from a problem that kept him from clotting his blood as he should, most likely autoimmune thrombocytopenia or AITP, also known as Immune-Mediated Thrombocytopenia or IMTP. AITP is an attack on the platelets of the body. Platelets are fragments of cells called thrombocytes and are very important in the clotting of blood. If platelet production is too low, or platelet destruction or usage is too high, normal clotting fails and bleeding ensues. In the case of autoimmune thrombocytopenia, platelets are diminished because of an attack by the immune system. For whatever reason, the immune system begins to think the thrombocytes and/or platelets are foreign objects in the body and need to be removed. The trigger for this condition is almost never identified. Autoimmune thrombocytopenia usually has a very rapid course. Onset is usually “sudden.” I put sudden in quotation marks because we rarely know when the actual beginning of an episode is, we only know it’s going on when we see evidence of bleeding. Treatment usually begins with a transfusion of platelets. Platelets are rarely available anywhere but an emergency or referral center, so your pet’s doctor usually doesn’t have them sitting on his shelves. Whole blood transfusion doesn’t include enough platelets to suffice, although it is better than doing nothing and the loss of red blood cells and volume still needs to be accounted for. Many of these patients die because the process has gone too far by the time treatment has begun, because of lack of platelet availability, or because the immune system’s attack cannot be stopped. For completeness’ sake I will address your other questions. While you don’t have rats, plural, it takes only one. Dogs eating a mouse or rat with active rodenticide in its gastrointestinal (GI) tract can easily become poisoned. A thorough necropsy of the entire GI tract might locate such an animal or its parts. Modern rat poisons are very effective in very small amounts, so the quantity a mouse might eat could easily poison a 55-pound dog. Poison he might have been exposed to weeks ago would not take this long to cause problems. If rodenticide was his problem, he ate it very recently. The likelihood of rat poison being in his food from the manufacturer is close to zero. All of our readers share in your sense of loss. See you tomorrow, Dr. Randolph. A great story of success. Thanks for reading, Dr. Randolph. “We” don’t have any advice for you, Edward. We do have prayers for you, because your dog got a bad, bad disease, neither you nor we will ever know what triggered this condition, and treatment is sketchy even for patients diagnosed early, when the condition is relatively mild. A large percentage of these patients go on to die later, even under treatment. Bella had a bad, bad disease, and all we can say is we join you in grieving for Bella, and we are so sorry that you lost her. Click here for an article on grieving. This story and others sound very similar to what we just experienced with our dog. Day 1 our Australian shepards face suddenly swelled it looked as if he had two balls one in each check. We live on a greenbelt so I instantly was worried he was bitten by a rattlesnake and rushed him to the vet where we were unable to find any bite marks only a slight bruise on his gums. The vet administered cortisone or benadryl shot and said they would think if it was a rattlesnake bite it would have been more swollen and he would have distinct fang marks. In 24 hours after the shot the swelling disappeared completely so I was not concerned about it. Then on day 5 after the swelling I noticed a little blood coming from his gums. I checked him and nothing was alarming and the bleeding appeared to have stopped. He chews on random sticks in our backyard so I figured a stick caused it. Then about 6 hours later I noticed one of his eyes the pupil was red and reflected red back at me when I shined a light into it showing signs of hemorrhage. We rushed him to the vet and by then his second eye began to turn red. The vet confirmed he was bleeding from every orifice and he had 0 platlets. She gave us the rat poisoning theory and agreed the facial swelling was odd and too much time has lapsed from the swelling to bleeding symptoms and thought he was bit by something or had and allergic reaction and now the bleeding isn’t connected. We do not own or buy rat poison and in fact we use Organic Pest Control because we are so careful about the use of toxic chemicals since we also have a 2 year old. She also called and talked to a specialist that theorized that a coral snake bite could have triggered the bleeding or triggered an auto immune disease response. She tested his blood cells for autoimmune and the blood cell didn’t react the way it would if it was autoimmune and strongly thinks every symptom lines up with rat poisoning. End of the story he died a little over 48 hours vomiting blood then progressed to his lungs filling up with blood. He had great energy and appeared strong until his lungs filled up with blood on the last day and he passed. He was treated with the vitamin K to try and get his blood to clot again. Any insight would be greatly appreciated since we are struggling to believe he died from rat poison. Our 3 closest neighbors don’t use rat poison either and he doesn’t eat dead animals. We’ve caught him catching rabbits and playing with them but never eating them. We also searched our whole yard for dead animals found none but his feces did have some dead dung beetles around them. Not sure if that’s another sign of rat poisoning too. Thank you very much! Warfarin doesn’t cause low platelet count, but reaction to the toxin of rattlesnakes can, to wit: We report 2 patients who presented with vasomotor symptoms and severe thrombocytopenia following rattlesnake bites. These symptoms persisted in spite of treatment with antivenin and transfusion of multiple doses of platelets. Thrombocytopenia is a common occurrence in moderate to severe crotaline envenomation. Algorithms suggested for the treatment of rattlesnake envenomation with crotaline-specific antivenin may not reverse the associated thrombocytopenia. The precise mechanism of venom-induced thrombocytopenia (VIT), even in the absence of significant coagulopathy, is unknown. While this is a report on human rattlesnake bite victims, the mammalian response is the same. Sadly, even some patients promptly treated with the proper (very expensive!) antivenin don’t respond. Fulminant immune-mediated thrombocytopenia might still be a possibility, although, I’ve never seen a case with zero platelets, that doesn’t mean it doesn’t happen. I’ve probably diagnosed fewer than ten such cases in my 36-year career. Regardless, we share in your sense of loss. Losing a beloved pet is heartbreaking, and we understand. We have been very worried if this is rat poisoning or autoimmune thrombocytopenia. Thank you very much for all the information in regards to our dog. We really appreciate it! Thank you! How is he doing now? He has passed away, unfortunately. So sad, Kristin, and we are so sorry for your loss. AITP is a tough, tough disease and even well-regulated patients often eventually succumb. Thanks for reading MyPetsDoctor.com. My Boxer/Lab mix developed bruising and would be extremely slow to heal little nicks and scratches. His platelets were at a 6, and supposed to be 200 I believe. He survived with the help of a experienced specialist, whose dog had passed of the same condition. Whether my dog was poisoned or not was never confirmed, but it was that or Comfortis flea medication, which showed no record of causing the issue in their reports. Pet insurance covered about half of the cost ( $2000 reimbursed), and Banfield adult care plan was a great cost saver, they recognized the issue very quickly, and referred it to more appropriate hands. In Austin, TX, they care about dogs immensely, so I believe their caring effort made a lot of the difference regardless of the overall quality of Banfield around the country. I am in Austin, TX, and my dog has the same condition. Who is your specialist? Your local veterinarian should be able to make a referral for you to a specialist nearby. We use MedVet Mandeville. S. Spina, I cannot imagine a connection between the two. but I’m betting Elanco would love to help you look into the possibility. You may contact them directly, or, if you need help, I’m sure your veterinarian would be happy to help. Best wishes, Dr. Randolph. My mini schnauzer also developed this autoimmune condition and I wonder if it was from Comfortis. There has never been any information implicating Comfortis in any autoimmune conditions. Thanks for reading MyPetsDoctor.com. What a gratifying story. May Rascal have many, many more birthdays. I am so happy that your veterinarian is on the ball for him. My husband and I have also just lost our wonderful Boxer (Sammy) to this elusive condition. It is soul-destroying not being able to figure out why or how this happened. Sammy, aged 8, also did not have access to any type of rat poison and has never eaten anything other than dried dog food and the odd dental stick from time to time! Donna, we are so sorry for the untimely loss of your Sammy. When patients with this condition respond to treatment we are thankful, while knowing that any minute that good response could turn bad. I’m so sorry you had to experience this. I lost a patient last week to IMHA that had been well-controlled. As it, too, is an immune system malfunction, we are on the edge of our seats from the time the diagnosis is made. May the Lord comfort you. Hello, our dog has been on Vitamin K1 for almost 6 weeks. We were afraid she may have eaten a mouse poison pellet so we took her to her veterinarian for treatment. She will be at end of k1 treatment cycle in few days. When k1 treatment is complete, how many days do we wait to take her for her blood clotting test and what is the test called? Thank You for your help. You helped us very much through this scary time with our dog. CB, the most commonly-used test is PTT, Prothrombin Time. Every case is different, and you should be guided by your veterinarian as to when he would prefer to perform the test. We are happy we could help and all of our readers whose pets have suffered similar fates breathe a sigh of relief with you. My 10 year old poodle was just diagnosed with autoimmune thrombocytopenia. She has been in the hospital for 2 days. She was improving, then started bleeding into the abdomen. Her doctor gave her a blood transfusion. Bleeding has stopped. She is stable, but critical. Blood count is 4. What are her chances of survival? If you could please advise me. Thank you. Jay, if, by “blood count” you mean red blood cell count, “4” is just under the minimum of normal for our lab, which is 4.8. Of course, many of those RBCs came from the transfusion, and it may take more transfusions before the platelet-destruction process is stopped. Some patients respond to corticosteriod-only treatment, while others require more advanced (and more expensive) therapies. I cannot accurately prognose your girl based on RBC count alone, but her primary veterinarian should be able to give you information. Sadly, in some patients, AITP cannot be stopped, and those pets succumb. I’m sorry you are having to face this. Please keep us posted on her progress, Dr. Randolph.